An analysis of data from a NASA Fermi Gamma-Ray Space Telescope turned up massive, previously unseen galactic structures. 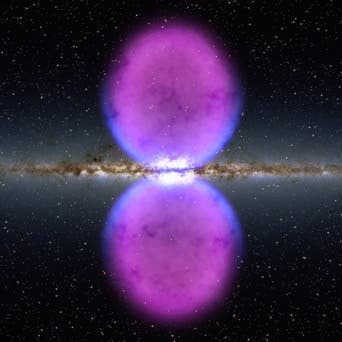 A group of astrophysicists located two massive bubbles of plasma, each extending tens of thousands of light-years, emitting high-energy radiation above and below the plane of the galaxy. The researchers found the structures in publicly released data from NASA's Fermi Gamma-Ray Space Telescope, which was launched in 2008 to investigate sources of extremely energetic photons—namely, gamma rays, which have higher frequencies than x-rays. From its orbital perch hundreds of kilometers above Earth's surface, Fermi has charted the location of gamma-ray sources with its Large Area Telescope (LAT). Where the gamma rays originate from is not always clear; the foreground of Fermi's view is clouded with emission from events such as cosmic rays striking dust in the Milky Way's disk. To get a better picture of the gamma-ray environment, Douglas Finkbeiner of the Harvard–Smithsonian Center for Astrophysics and his colleagues carefully subtracted those sources based on maps showing locations of cosmic dust, models of the galactic disk, and known emitters of gamma rays, such as active black holes in other galaxies. "Fermi Bubbles" is the term used by Richard Carrigan at the Fermi National Accelerator Laboratory in his latest work on the search for artifacts like Dyson spheres or Kardashev civilizations. A Fermi bubble according to Carrigan would grow as the civilization creating it colonized space. Carrigan notes that, as Carl Sagan and others have observed, that the time to colonize an individual system is small compared to the travel time between stars. A civilization could engulf its galaxy on a time scale comparable to the rotation period of the Milky Way, or every 225–250 million years, and perhaps, fewer. According to Carrigan, of the 11,224 potential sources of low range emissions identified that might be a manifestation of Dyson spheres in the Milky Way there are only 16 that have strong potential.